On 20 May, The artists of €urovisions (the new show of European Souvenirs) will perform in Eye Film Institute in Amsterdam. EYE is the Dutch centre for film culture and heritage, is dedicated to developing a vigorous film culture in the Netherlands. €urovisions also makes use of the archive of Eye’s collection. We are selling out! Buy your tickets now € 10 / 8,50. Mainstream media often shows one side of migration. But what is the story told by the people who migrate to Europe? Running up to the upcoming European elections in May 2014, €urovisons, a new show by European Souvenirs, proposes a glimpse on migration from the migrant perspective. This live cinema performance portrays migrants chasing a European dream and look at the way they are represented in the media. Remixing live cinema and documentary techniques (multiscreen, live music, audiovisual actionism, sampling and cut-ups) into an audiovisual performance,€urovisions takes you on a trip in Europe and the homelands of newcomers: migrants, nomads, tourists and souvenirs are guiding you through time and history. We see pictures of migrants on the news, illustrating rhetorics about the political and economical causes and pre-assumed effects of migration – but what are their names? Why are they here? What are their own personal stories? And why don’t the media bother to report on people’s dreams? Once, we were all migrants. 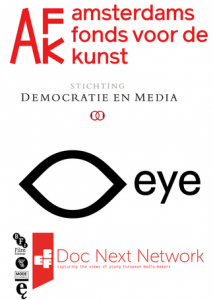 The show of €urovisions in Eye Film Institute Netherlands is supported by the AFK (Amsterdam Fund for the Arts).